Below are common attributes associated to Alba Luxurians Clematis. Become a care taker for Alba Luxurians Clematis! Below are member comments regarding how to plant Alba Luxurians Clematis. No comments have been posted regarding how to plant Alba Luxurians Clematis. Be the first! Do you know how to plant Alba Luxurians Clematis? Below are member comments regarding how to prune Alba Luxurians Clematis. No comments have been posted regarding how to prune Alba Luxurians Clematis. Be the first! Do you know how to prune Alba Luxurians Clematis? Below are member comments regarding how to fertilize Alba Luxurians Clematis. No comments have been posted regarding how to fertilize Alba Luxurians Clematis. Be the first! Do you know how to fertlize and water Alba Luxurians Clematis? Below are member comments regarding how to deal with Alba Luxurians Clematis's pests and problems. 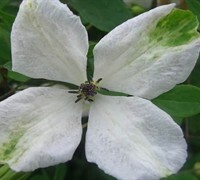 No comments have been posted regarding how to deal with Alba Luxurians Clematis's pests and problems. Be the first! Do you know how to deal with pests and problems with Alba Luxurians Clematis? Looking for Alba Luxurians Clematis? Below is a link to helpful information on planting and growing clematis vines. Click on this link to go directly to the information. Below is a link to helpful information on fertilizing and watering clematis vines. Click on this link to go directly to the information.